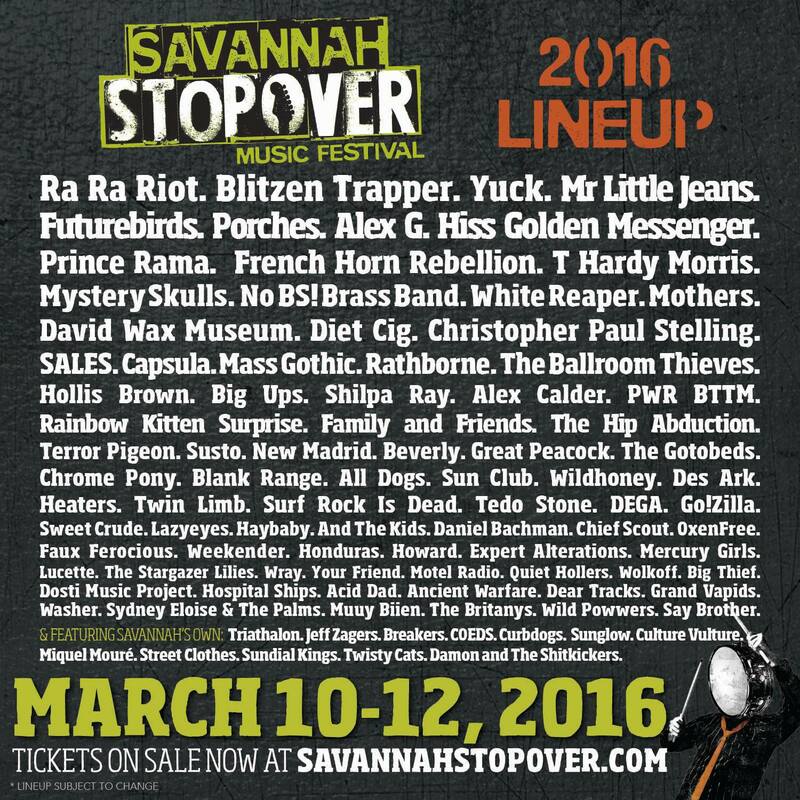 Ra Ra Riot, Blitzen Trapper, Yuck, Mr. Little Jeans, and Futurebirds will headline the 3-day Savannah Stopover, which will take place from March 10-12 at venues across Savannah’s famed Historic District. Today’s press release from the festival confirmed over 50 additional bands that join the 40 or so that have already been named. In the coming weeks, Stopover might announce additional bands and confirm a few single occasion events like Stopover In The Yard. As we’ve noted before in this space, Stopover is all about discovery. You won’t know all the bands in the lineup, but you can spend the better part of three days wandering from venue to venue and checking out acts that Stopover staff has spent much of the past year selecting. We love it. The Artist Lounge will once again be below ground at 109 West Broughton (formerly Sub zero). The Stopover HQ and Ticketing Office will be at 220 West Broughton Street, with the opening date to be announced. Of course, tickets are now on sale. On Friday and Saturday, the atrium of the Jepson Center for the Arts will be used for the Band Poster Exhibition and for bar service during the concerts at Trinity. Up-and-coming acts noted in today’s festival press release include Porches, Alex G, Diet Cig, PWR BTTM, Mothers, Mass Gothic, Rainbow Kitten Surprise, White Reaper, All Dogs, and Twin Limb. On Saturday, March 12th, the festival will host a daylong showcase featuring two Savannah-based record labels, Graveface Records and Furious Hooves Records, along with Noisy Ghost PR. The festival will also host 3 to 5 secret shows over the weekend, which will be announced one hour prior to the performance via Twitter. The 6th annual Savannah Stopover will include about 100 bands from across the country and around the world, many of whom will be traveling to SXSW the following weekend. Like the festival itself, emerging acts dominate the list of 12 local Savannah bands chosen for this year: Tri​a​thalon, Jeff Zagers, Breakers, Curbdogs, Sunglow, Culture Vulture, Twisty Cats, Mi​q​uel Moure, COEDS, Sundial Kings, Street Clothes, and Damon and the Shitkickers. Stopover is also kicking off an Ambassadors Program for fans to sell tickets and earn reward points that can used for free festival passes and other perks. 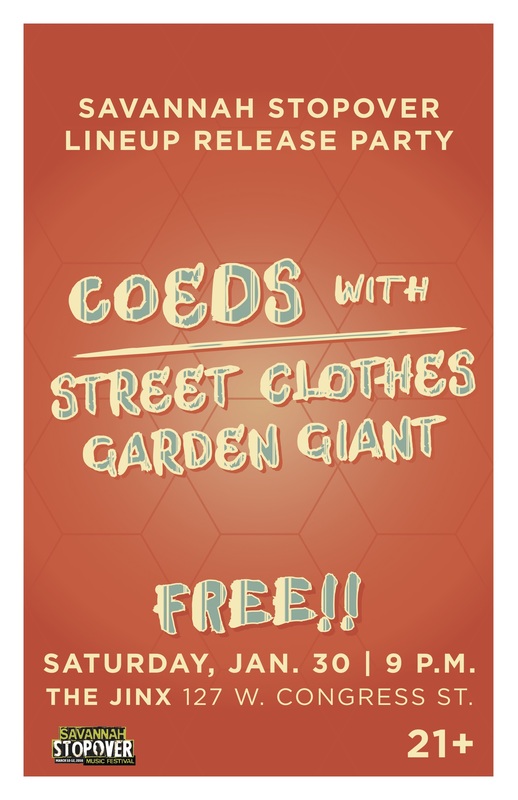 Also, please note that the free Lineup Announcement Party is confirmed for Saturday, January 30th at The Jinx featuring an all local lineup of Garden Giant, Street Clothes, and COEDS.